U.S. Geological Survey (USGS) and National Park Service (NPS) personnelcollected long-term (14 months), high-resolution physical and chemical oceanographic measurements at the USS Arizona Memorial in 2002-2004 to better understand the nature of the environment surrounding the mostly submerged historic ship. Scientists used two bottom-mounted, multi-parameter instruments deployed in water depths less than 10 m to record critical environmental data. 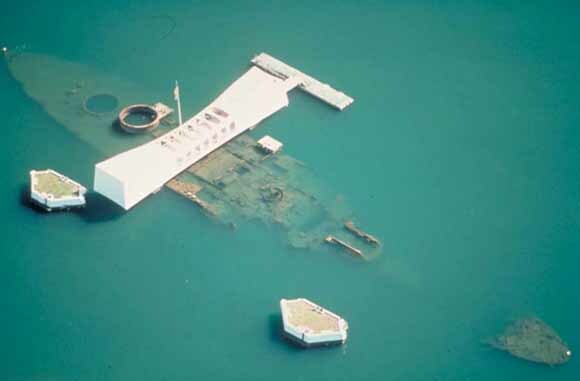 This study supports the National Park Service's Submerged Resources Center (NPS-SRC) research directed at understanding and characterizing the nature and rate of natural processes affecting deterioration of the National Historic Landmark (NHL) USS Arizona. The purpose of these measurements was to collect hydrographic data to better constrain the nature of the physical and chemical environment on the submerged vessel hull and near the Memorial to determine how they vary over the course of a year. This project represents a multi-agency approach to acquiring sound scientific data requisite for future stewardship-based management actions. Several organizations cooperatively funded this project: USGS, Department of Defense Legacy Resources Management Fund, NPS Systemwide Archeological Inventory Program, USS Arizona Memorial, Arizona Memorial Museum Association, and NPS Submerged Resources Center.